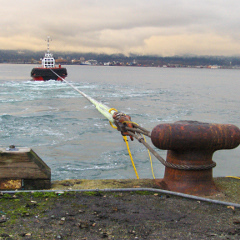 In addition to Weir-Jones' suite of Marine solutions, we also offer Bollard Pull Testing up to a 100 tonne capacity. It is often a statutory or classification requirement to perform a Bollard Pull Test with a third party. Weir-Jones maintains a set of calibrated bollard test testing gear, which can be deployed to the ship's home port. Using this equipment, the personnel will guide the captain through the Bollard Pull Test procedure and record the forces measured. The data will then be processed and plotted, and a concise summary report will be supplied. This report can be used as verification of the vessel's capacity.